How Often Should I Upgrade My SOLIDWORKS Workstation? I get asked frequently about hardware in regards to SOLIDWORKS. Sometimes it's people getting ready to buy their first license and asking about, “What would a good computer be for me to run it on?” Sometimes it’s a big engineering department head asking,“What should we look at for hardware upgrades this year?” You get the idea. I’m the guy most of these questions come to at Alignex. What I’d like to do in this blog article is give you some real-world performance numbers that will let you see for yourself how upgrading your computer hardware could help your day-to-day work. So just recently I built a new home workstation. My previous one was still rock solid and running great, but I built it back in 2012 so it had been over 5 years since I had a hardware upgrade. At the time I built my old system, it was state of the art & top of the line. That was one of the reasons 5 ½ years later it was still going strong. 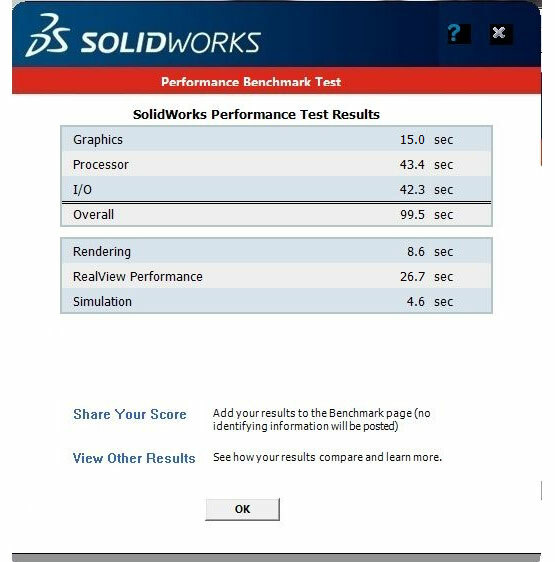 Nothing wrong with it and still Ok speed wise, but the hardware landscape has changed a lot since then and I was eager to see what all the cool new technology in CPU’s, GPU’s and SSD’s could do running SOLIDWORKS. Here are the quick specs on the “guts” of the two computers. I won’t go into too much detail regarding some of the fine detail like the motherboards, or RAM timing etc. for fear of people’s eyes glazing over, but this will give you a rough idea of the configuration of the old and new builds. As you can see, this box was a workhorse. One of the first mass production 6 core Core-i7 CPU’s, 32 GB’s of RAM and a fast SSD plus a real Quadro card for running SOLIDWORKS. I was in CAD heaven when I built this in 2012 and it was still soldiering along quite well. So, on the surface many things are the same. Both old and new computers are 6 core Core-i7 CPU’s, they both have 32 GB’s of RAM and both have a good Quadro card and fast SSD hard drives. But beneath the surface there are quite a few differences. 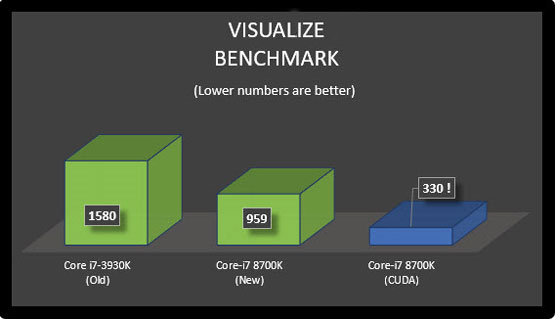 Although both CPU’s are from Intel and are Core-i7’s with 6 cores, that’s where the similarity ends. The 3930K was a 3rd generation Core-i7, while the 8700K is the latest 8th generation design. In simple terms that means that the engine under the hood has evolved A TON! Not only is it about a whole Gigahertz faster in clock speed, but the architecture of the CPU has changed drastically and is more efficient. Both machines have SSD’s. While the old machine had a state of the art one for 2012 it was SATA III which meant all of its data went through the SATA controller which was originally designed to handle old fashioned spinning mechanical hard drives. As SSD’s (and the RAM memory they are made up of) got faster and faster this became a serious bottleneck. Enter the M2 NVMe SSD’s. These new designs actually run through the PCI-Express bus (the same one your graphics card uses). This is a YUGE difference. Imagine trying to move a mountain of freight from point A to point B using a horse and buggy vs modern mile long freight trains. Both machines have an entry level Quadro card. The one in 2012 was the FX-580, and the one from today is the P-400. 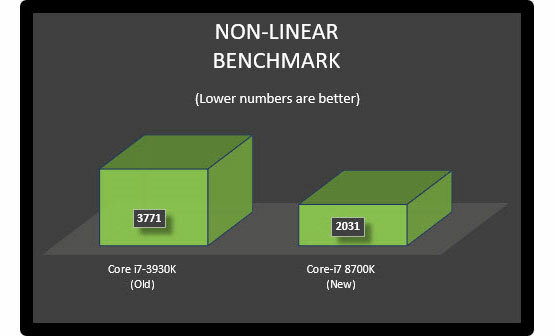 The comparison of these two is very much like what we discussed with the evolution of CPU’s. Newer faster architecture. But even more exciting is the addition of new features. 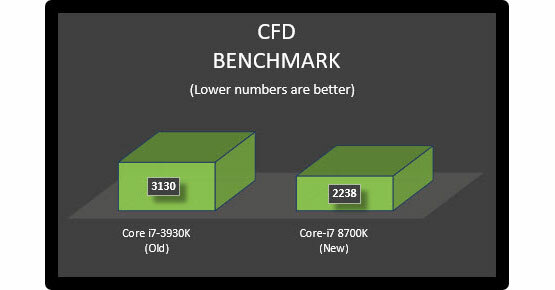 Read on to learn about CUDA cores in Nvidia graphics cards to see what a huge difference they are making in some applications. 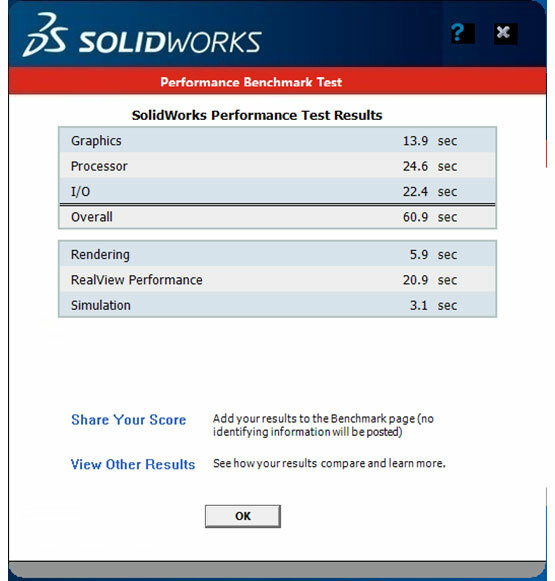 The first one is the SOLIDWORKS Benchmark overall score. I included both the simulation and rendering options when running this one to push the systems as much as possible. 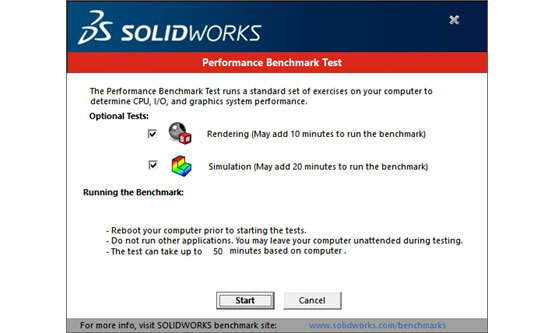 This is a great test to run to get a sense of your computers overall performance running SOLIDWORKS. The test checks many different individual functions of your computer. I will include the detailed results for this test at the end. For now, let’s just concentrate on the overall score which is an aggregate of all the tests run by this benchmark on your computer. Our next benchmark is the Non-Linear Dynamic Simulation test. This test simulates the dropping of a very large weight onto a metal structure and the resultant impact and deformation. This solver is multi-threaded so it can take advantage of our 6 core processors, but due to the type of math and how it’s solved, it’s also sensitive to clock speed. The next test I ran was also a simulation run, but this one was a CFD (Computational Fluid Dynamics). Once again, a very complex solve with complex math. This solver loves multi-threading. It will scale faster and faster the more CPU’s you throw at it, but it’s also very demanding math so clock speed is important as well. The final speed test is a rendering test using SOLIDWORKS Visualize. This is a great benchmark to run for testing a system's multi-processor / multi-threading capabilities. Both the old and the new computer have 6 cores with Intel’s “Hyper-Threading” feature which essentially gives them 12 cores. As you can see this particular chart looks different from the three previous. I added the third category (CUDA) to illustrate another advancement in hardware since I built my old computer in 2012. 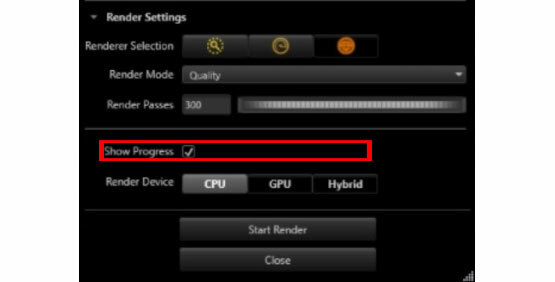 Some applications can now take advantage of the compute power of newer graphics cards and their GPU’s (Graphics Processing Units). The GPU is like your CPU but simpler, although there are many more of them. Nvidia calls them CUDA cores. The Visualize application allows you to select if the rendering gets done using your CPU only, your GPU only, or a Hybrid approach where the application will use all available resources to render the scene. Rendering jobs are unique in that every pixel in a finished rendering is a calculation, so there are a great many but each calculation is fairly easy to do, hence the FANTASTIC performance of the new computer using the capabilities of the Quadro P-400 with its 256 CUDA cores! The important ones above are the two in green as they were set to run using the CPU only mode so we could get an apple to apples comparison of the old and new computer. But to be fair the new computer has some new features (the CUDA cores) without having to buy anything else so it’s OK to include the blue results. 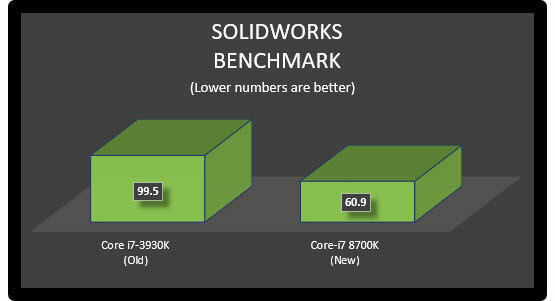 Here are the detailed results of the SOLIDWORKS benchmarks. I’ll break down and compare each result in % change between old and new. The categories are fairly self-explanatory. As you can see, the new computer is significantly faster than the old one (and the old one was still a good computer). If you think about the amount of time you spend running SOLIDWORKS everyday then the average of being 30% faster in almost everything you do could save you a lot of time over the course of a year, not to mention if your computer lasts as long as my last one! Moral of the story, buy a good workstation to run SOLIDWORKS! You’ll work faster, be more efficient and it will last longer. Mack Rasmussen is the Technical Director at Alignex, Inc. It’s rare for Mack to have a spare moment between leading Alignex’s team of application engineers and supporting our sales team, but when he does, you’ll most likely find this avid sportsman in the outdoors—skiing with his son, camping, fishing or hunting. © 2019 Alignex. All Rights Reserved.